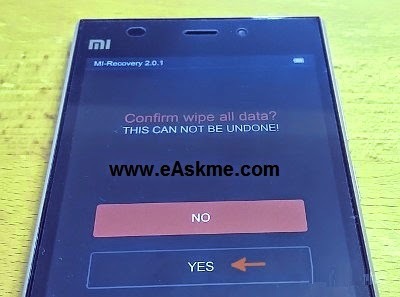 If you are facing the issue with your Xiaomi Mi3 as if it stuck on android boot loop, MI logo screen, then you can easily fix these issues by following these steps. This problem occurs when you is update new version of android via flashing the rom on your android device or via recovery mode. 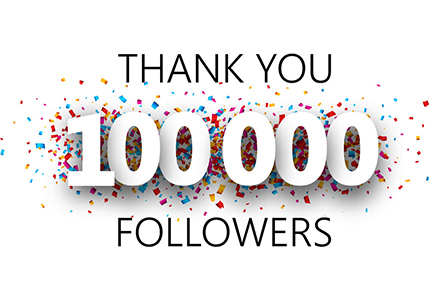 here are the steps to solve this issue easily. 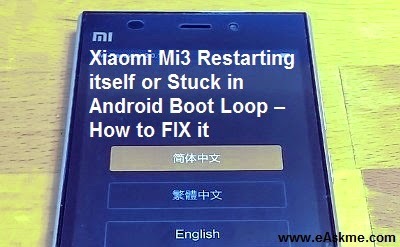 If Mi3 restarting again and again then go on updates and click menu button then choose "Reboot to Recovery Mod" or if phone stuck on MI logo then turn off the phone by pressing power button. Now Press "Power+Volume Up" button to open recovery. In recovery Mode from menu select language "English". Now choose "Wipe & Reset". Next screen will open , now choose "Wipe All Data". Now choose "yes" to erase settings and data of your device. When finish go back to menu and reboot.